English and language arts teachers must contend with what seems like a full-on assault of grammar teaching these days, yet the teaching must go on. For basic concepts such as verbs and nouns, the process can be relatively easy. However, for more difficult topics (especially when teaching non-native English speakers) such as articles and determiners, it becomes difficult to keep the students engaged enough for them to internalize the concepts. Articles and determiners need not take up too much class time as long as you begin with the easier concept, build on what the students have already learned, and incorporate exercises that make learning grammar a bit less tedious. Native and non-native English speakers will benefit from starting first with articles. Although English speakers will readily understand the function of the articles, non-native speakers might become easily confused. Begin with the definite article "the," and work toward "a" and "an." Provide examples of when to use each. Explain the difference between countable nouns and non-countable nouns, in order to introduce article rules to the students. Countable nouns are those which can be pluralized, usually by adding the suffix -s or -es. Non-countable nouns cannot. While table can be pluralized (and thus is countable), information cannot (no one would write "informations," would they?). If a noun is singular and countable, explain that an article is nearly always necessary. Articles are among the more common determiners in the English language, used frequently and in nearly every context and type of writing. When teaching articles and determiners, make sure you point out that the purpose of the articles is to demonstrate whether that which is being indicated, in speech or in writing, is definite or indefinite. An indefinite article (a, an) is used when that which is being indicated is non-specific. For example, explain that if you were you say "a car drove by," it would mean something very different than the definite "the car drove by," indicating specificity. Articles are three of about 50 determiners used in the English language. Once these two concepts have been explained and the students have demonstrated understanding, it's time to move on to different types of determiners. Determiners determine the character of a noun, and as with articles, impart certain characteristics. While the articles demonstrate specificity, other determiners might demonstrate the quantity, possession, or nearness to the speaker. Begin with the possessives, such as "my," "her," and "his." These will help indicate the relationship of the determiner to the noun. Continue through the demonstratives (this, that, these, those) before touching on the difficult once such as "enough" and "either." By now, you will have built the foundation on which more difficult concepts can be layered without too much frustration. The Internet is one of the greatest teaching resources available. There are interactive exams, quizzes, and game ideas for you to try in the classroom that demonstrate the distinction between articles and determiners and can help you flesh out the concepts in a fun way. Whatever age level you teach, make sure to incorporate some measure of activity into the learning process. A huge part of the fight against the anti-grammar mentality is battling the notion that grammar is necessarily boring. It is not! Grammar can be interesting and exciting, and as students make the connections between language that they know and understand and the new concepts they are beginning to learn, chances are they'll think it's fun too. Also, remember as you teach that every student possesses the ability to learn. Not a single one of your pupils is so far beyond reach that articles and determiners are impossible for them to learn. Once you find out how to pique their interest and activate their drive for excellence, you will notice them studying articles and determiners more intently as you teach. These concepts may be difficult for some, but they are far from out of reach-whether your student is a native English speaker or not. "Teaching Determiners and Articles." YourDictionary, n.d. Web. 24 April 2019. <https://education.yourdictionary.com/for-teachers/teaching-articles-and-determiners.html>. English and language arts teachers must contend with what seems like a full-on assault of grammar teaching these days, yet the teaching must go on. For basic concepts such as verbs and nouns, the process can be relatively easy. 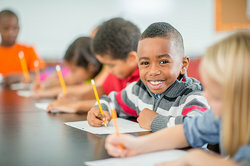 However, for more difficult topics (especially when teaching non-native English speakers) such as articles and determiners, it becomes difficult to keep the students engaged enough for them to internalize the concepts.Articles and determiners need not take up too much class time as long as you begin with the easier concept, build on what the students have already learned, and incorporate exercises that make learning grammar a bit less tedious.